The Haines 2.0 Solar Cooker is designed and manufactured by Roger Haines of San Diego California and was the result of 3 years of research to produce an inexpensive, easy to construct an effective solar cooker for use in developing countries. This is a great cooker. Built to last longer than similarly designed panel cookers, and it's an efficient and effective cooking unit. 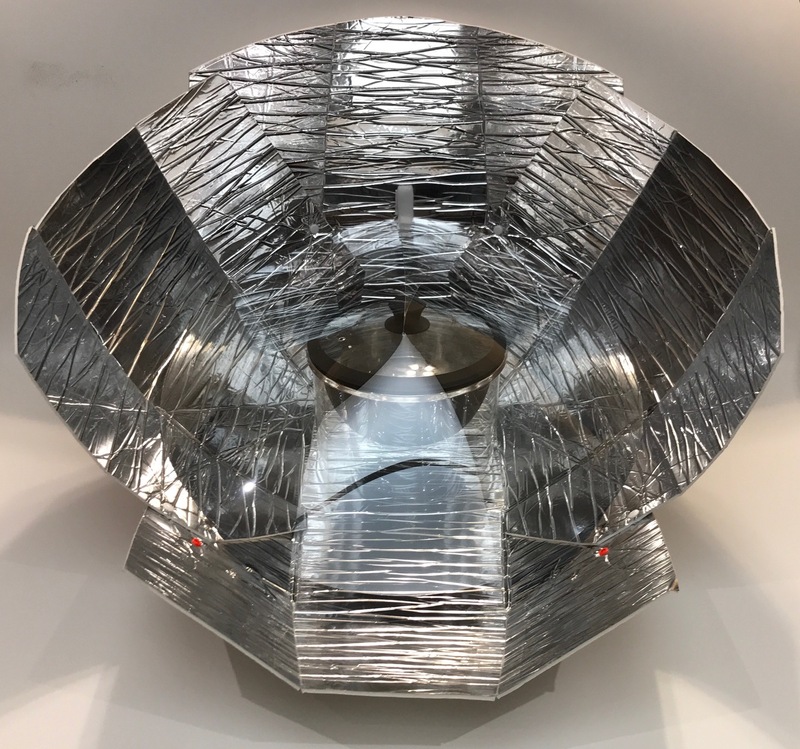 We encountered the original Haines Solar Cooker during the Solar Cookers International (SCI) Convention in Sacramento, California July17-19, 2014, and we were impressed by its simplicity, ease of set-up and use, and its effectiveness; not to mention how compact it is. 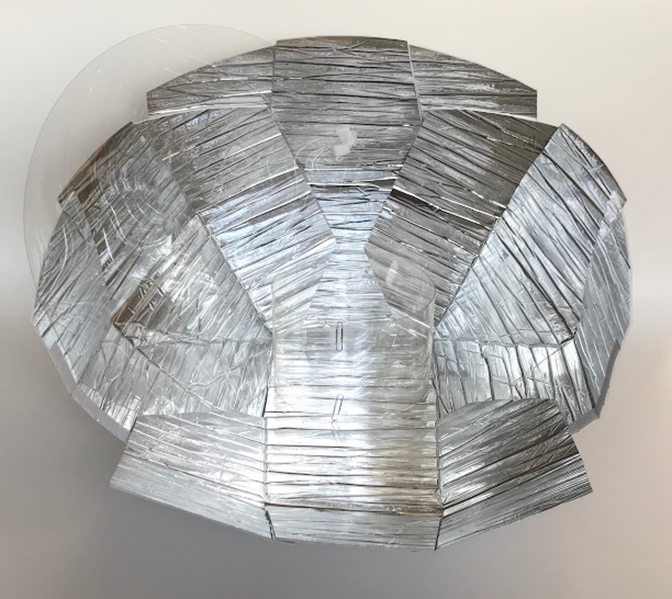 The new 2.0 version is made of the same metalized polyester (MPET) foam material, but is larger, more parabolic in shape, and heats faster than the original. The reflector is made of IXPE (cross-linked polyester) foam insulation bonded with reflective metalized polyester film (MPET film / 3mm IXPE foam / white PET film). The reflective polyester will not oxidize, cannot be scratched off, and has a high melting point. Importantly, the new material is easy to recycle and is environmentally safe through the whole production and recycling process without pollution. In the U.S., this material is used to make high-end auto windshield sunshades. The windscreen is a 30 cm. (2-foot) diameter circle of 0.5 mm (.020-inch) of UV-resistant poly-carbonate film. For increased rigidity, a radius cut is overlapped two inches to form a flat cone like a sun hat. The windscreen makes the cooker quite rigid in windy conditions, and creates an "oven-like" atmosphere around the cooking pot. A brick placed on a flap at the back of the cooker holds the reflector firm in the wind. 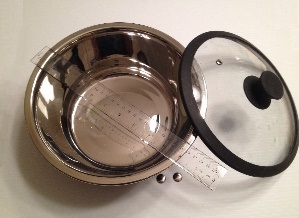 The cooking sleeve - Other panel cookers often require the cooking vessel to be enclosed in glass or a plastic oven roasting bag in order to retain heat. 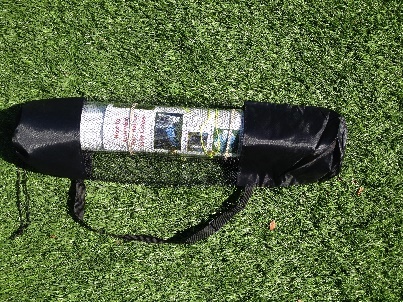 Instead, the Haines 2.0 Solar Cooker relies on a "sleeve" of .020-inch (0.5 mm) UV-resistant poly-carbonate film. The sleeve consists of a 6" x 36" (15 cm x 92 cm) rectangle of poly-carbonate film rolled into a cylinder slightly bigger than the cooking pot, and secured with ordinary paper clips. The top rim of the cooking pot rests on the top edge of the cooking sleeve thus insulating the cooking pot and elevating it off the surface of the reflector, allowing the sun to be reflected onto the bottom of the pot. The sleeve works best with a pot with a glass lid, which also acts as an insulator. Note: The Haines 2.0 Solar Cooker no longer comes with the black 4 Qt. Dutch oven cook pot pictured above. It now comes with a stainless steel cook pot pictured below. 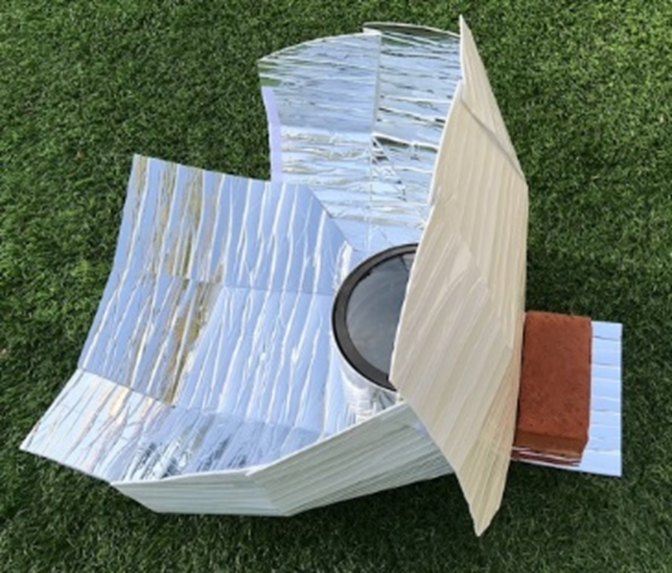 Like other solar panel cookers the Haines 2.0 Solar Cooker is comprised of a simply constructed reflective surface that gathers, or concentrates the suns rays onto a dark colored cooking vessel. To retain heat, ordinarily the cooking vessel is enclosed in glass or plastic, such as oven roasting bag. In the case of the Haines 2.0 cooker rather than using an oven (turkey) roasting bag like many panel style cookers do, the manufacturer decided to use a material that would last longer than the standard oven roasting bag and would be easy to use while at the same time would be effective in retaining the accumulated heat energy in and around the cook pot. 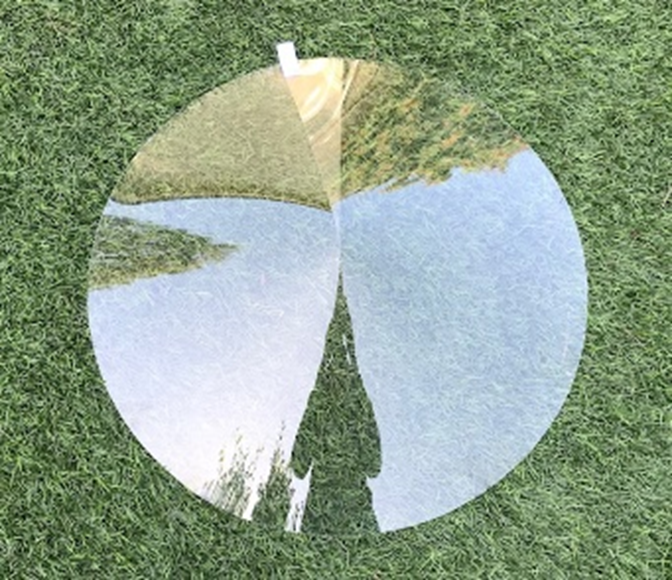 The wide open and properly angled reflector panels capture a lot of sunlight, reflecting it onto the cooking vessel and the wind screen helps to reduce heat loss that is sometimes and issue with some panel style cookers. The cooking sleeve is designed so that it will fit around almost any of the small-large pot/pan sizes available (no handles) making the sleeve an effective glazing to hold the heat close to the cooking vessel. If one wishes to use oven roasting bags with this cooker you can do so just as easily as using the included cooking sleeve. This would allow one to cook using a pot/pan that has a handle, if that were the only cooking vessel available. This cooker is easy to set up, effective in its ability to cook and is definitely a nice cooker for the backpacker, outdoor enthusiast, and for the person who wants to have an extra and viable means to cook in times of emergency or disaster. 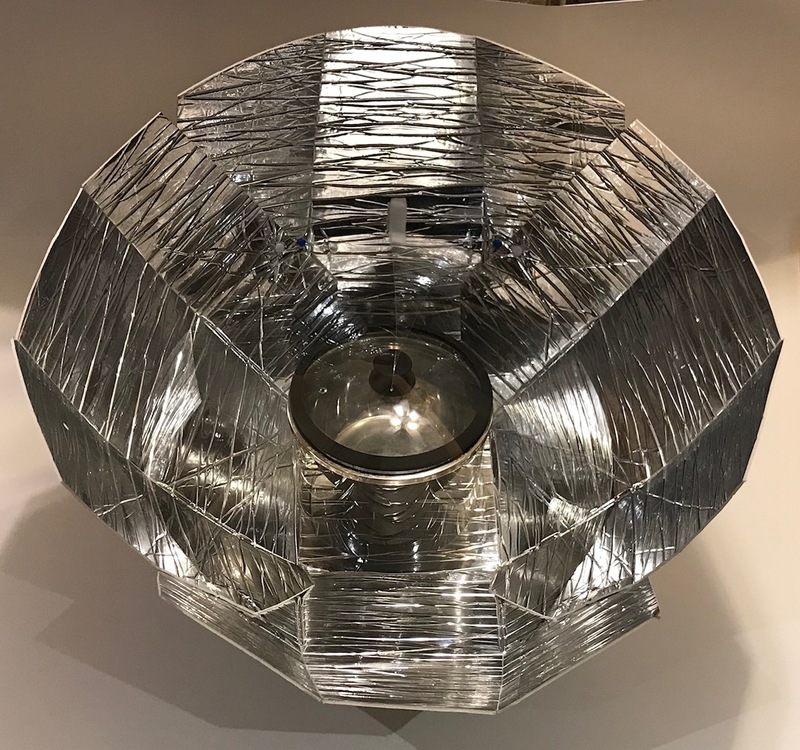 But, don't put this solar cooker away until needed for an emergency, keep it out where you can use it every day the sun is shining, because it is that easy to use. And it will not only cook your food well, but it might save you a little on the electric bill and intrigue the neighbors at the same time. The Haines 2.0 Cooker is more rigid than a lot of similar style panel cookers and is more able to withstand breezes which can be a challenge for other soft material panel cookers. This cooker also has an advantage of more efficient cooking with the added protection and heat retaining feature of the windscreen that covers the cooking pot. Reflector Panel: rolls into round tube. Permits cooking process to be observed through glass without lifting lid. -A very compact and useful solar cooker for backpackers and outdoors enthusiasts. 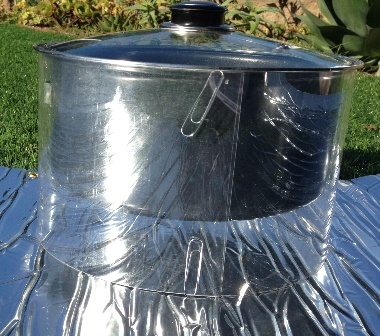 We wholeheartedly recommend the Haines Solar Cooker.